The Relief Portraits of Lawgivers depict historical figures noted for their work in establishing the principles that underlie American law. The 23 marble relief portraits over the gallery doors of the House Chamber in the U.S. Capitol depict historical figures noted for their work in establishing the principles that underlie American law. They were installed when the chamber was remodeled in 1949-1950. Created in bas relief of white Vermont marble by seven different sculptors, the plaques each measure 28 inches in diameter. 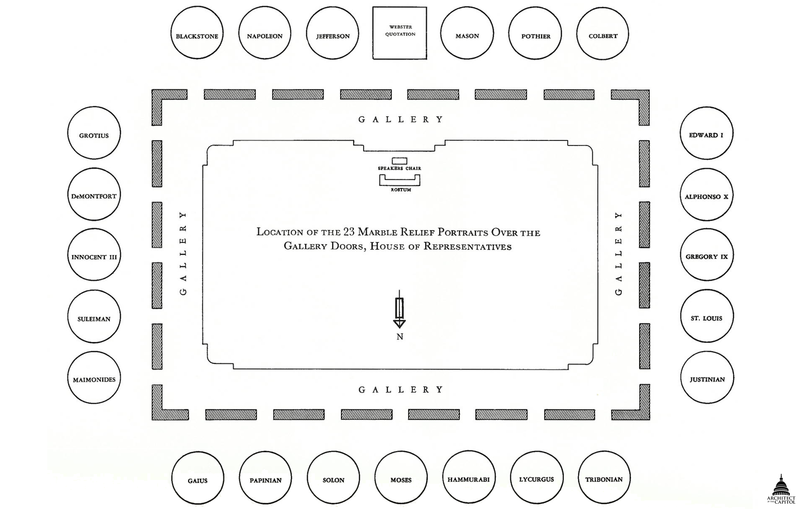 Map of portraits in the House Chamber. Click on the image above to enlarge. The 11 profiles in the eastern half of the chamber face left and the eleven in the western half face right, so that all look towards the full-face relief of Moses in the center of the north wall. The subjects of the reliefs were chosen by scholars from the University of Pennsylvania and the Columbia Historical Society of Washington, D.C., in consultation with authoritative staff members of the Library of Congress. The selection was approved by a special committee of five Members of the House of Representatives and the Architect of the Capitol. The plaster models for these reliefs are on display on the walls in the Rayburn House Office Building subway terminal.